I wander away to have a life, away from life. Sometimes, all we need is a nice break. A break from the stressful busy schedules and our monotonous city life. After having missed one such opportunity last week (the visit to Palghar), the trek to Vitangad fort on June 2 was something I was looking forward to and had me in absolutely high spirits! Having slept quite early on Friday night, it didn’t come to me as a surprise when I lay awake in bed at 4 am – a good one hour before my alarm was actually supposed to wake me up (or was it plain excitement, I wonder!). Quickly dressing, I ran through the list of things that I was supposed to carry for the trek and meticulously checked if I had each and every thing in place (Can’t really afford to spoil the first trek of the season, right?). Water bottles – check. Cap and sunglasses – check. Extra pair of change – check. Chips and chocolates – check. Wallet – check. The bus reached Kalanagar at 6 am sharp and we jumped in to save ourselves the best seats. We reached Sion in no time but the otherwise always punctual Sion-crowd was running late today!! We had to wait for another 5 minutes before the group started hopping into the bus! What followed was a series of “HIs”, “Whatsups” and the usual fights for the window seat. Another 5 minutes later, on arrival of the last entrant, the bus took off for the final destination – Tikona! The Tikona-Peth village that houses the Tikona a.k.a Vitangad fort is at a distance of 17km from Lonavala and 15km from Kamshet. The village can be reached through either of the routes, but we decided to go via Lonavala. 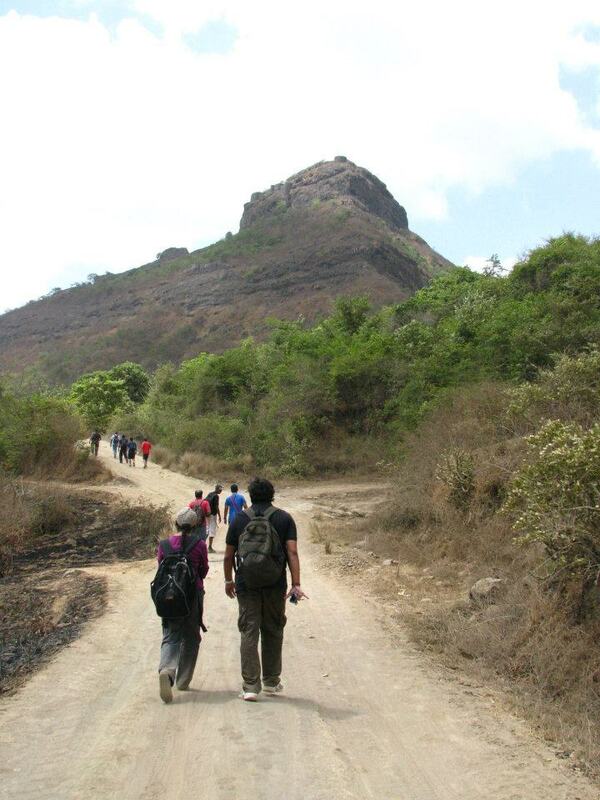 En route Lonavala, we had the last trekker join in at Vashi. Excitement was in the air! Groups were formed and biscuit packets were out! Why? We had loads of catching up to do, didn’t we? That early-morning-sleepy feeling was finally vanishing and the chit chatting was beginning to gain command over the drowsy feeling! The plan was to reach Lonavala by 8.30 am, have breakfast, collect the lunch packets and leave for Vitangad by 9 am. In spite of the slight delay at Sion, we reached Lonavala well before time – at around 8.15 am – and headed to Purohit’s Holiday Resort for breakfast. Having been greeted by a lovely, pleasant weather, all of us were hungry enough to gobble down the delicious idli-vadas in no time! Of course, after such a long drive, an unlimited breakfast was always welcome! Breakfast was done by 8.50 am (that includes having tea and coffee – the masala chai was so amazing that many of us found it difficult to resist a second cup). After the delicious breakfast, having picked up our food packets and all the freshening up, the enthusiastic trekkers got back to the bus, ready to head to the place that mattered most – Tikona. The filling meal we had just eaten sure seemed to have its own side effects and the trekkers were yawning and dozing away, again. However, everyone was awoken – on Rushikesh’s call – as the beautiful Pawna lake came in sight! There was chattering all over again, plans of having a picnic lunch by the lake surfaced and the picturesque Pawna lake had managed to leave all the 18 trekkers enchanted for long enough! We reached Tikona-Peth in no time and excitedly hopped out of the bus immediately as it halted. The customary Circle of Introduction was formed and the group of trekkers was officially introduced to each other. This was a major ice breaker as many of the trekkers were travelling with Breakfree Journeys for the first time. Soon, by 10.50 am, we started walking towards the base. From all that we had read about Tikona fort, we knew there were two routes to reach the fort – one was shorter but tougher while the second route was longer but comparatively easy. Because we were trekking with nearly eight first timers on board, we decided to take the easier route.The route to the base was through a dusty road, from the village clearing. The trekkers were high on energy and enthusiastically marched towards the base. We reached the base in no time, and were welcomed by an ‘All the best’ sign on a giant rock. A well marked trail lay in front of us. On our way up the mountain, we crossed numerous mango and fig laden trees. Picking up a few raw mangoes and figs, we continued on our journey to the top. Soon, the water bottles and gatorade started surfacing from the bags. The climb was not difficult, but the heat managed to make us break quite a sweat. Diligently climbing the slope, the trekkers were busy chit chatting and clicking pictures (and posing for them, too!) Soon enough, we reached the ‘darwaaza’ – a cave-like door to the fort, which was a major relief from the heat. After a quick water break, some chit chatting and a few pictures, we continued climbing uphill, waiting to reach the top. Following the trail, we continued walking up to the fort (yeah, someone also commented that Shivaji shouldn’t have built the fort after all because nobody was crazy enough to come so far and climb that high hill just to get to the fort – we’re used to such comments already) We crossed by a Hanuman statue followed by a water tank that contained massive catfish. We also came across a gigantic lime grinder! The cameras were handy, and the trekkers were happily posing for pictures throughout the climb! After crossing the water tank, we came to the Shivaji Trail. We had to climb giant steps to get atop the mountain! The steps had wires attached on one side to help trekkers climb up easily. Climbing higher up (yes, there were more such steps) we discovered a cistern adjacent to a cave. We quickly removed our empty bottles to refill them with the cool water from the cistern. The place was so cool and soothing, that it was immediately decided that we’d have our lunch there. Finally, by around 12.20pm, we reached atop the fort! The trekkers went berserk clicking pictures, gasping at the view from the fort and exploring the hill top. It was here that we came across the caretaker of the fort. Named Sujit, he mentioned that his forefathers were Mavalas(soldiers) of Shivaji. After whom, this taluka is named – Maval. 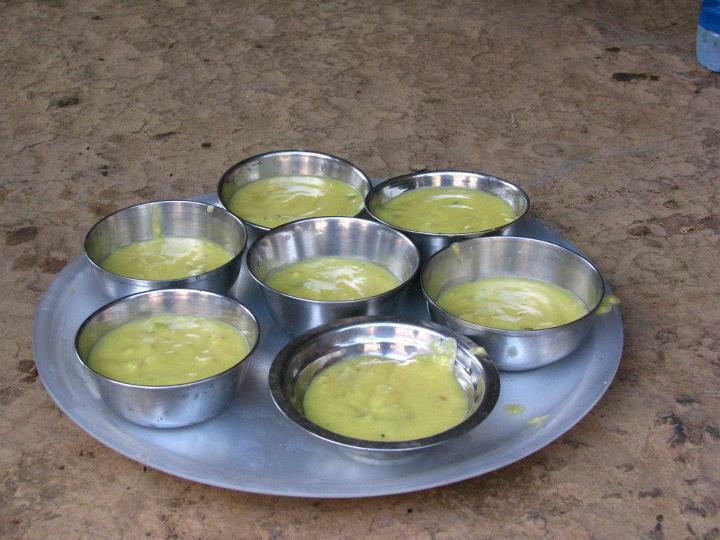 On prodding further, we got to know that he also served ‘Pitla-bhakhar’ – local staple food – back down at his house in the village. The trekkers were all set and extremely enthusiastic about tasting the local delicacy! Sujit also mentioned that during the rains, the fort is visted by 400 people at a time! That’s when we realised how lucky we were to have the fort all to ourselves! After spending some more time on the top, clicking the Breakfree group picture and visiting the “Trimbakeshwar Mahadev” temple that was located right atop the fort, we climbed down to the cave and cistern to have our biryani meal. Chocolates and masala chaas were also out in no time! So much incentive for climbing right to the top! Post lunch, at 1.50 pm, the trekkers lazily but steadily began climbing down. It is always difficult to trek after eating a hearty meal, but lunch being another ice breaker the trekkers were in a joyful mood happily talking and cracking jokes. The descent was much quicker than the climb (maybe it was the delicious pitla-bhakhar that tempted the trekkers to rush down!) and we were already at the base by 2.30 pm!! We sat at the base in the shade of trees to relax after the long climb down. After some much required relaxation, we walked on the dusty road again to get back to the village. On reaching the village the trekkers went hunting for a cold drink shop! There was havoc as soon we reached the shop for nothing looked more tempting to the thirsty trekkers after such a long walk down! After soothing ourselves with cold drinks, we reached for Sujit’s house – which was barely a few minutes away. The ladies of the house served us with freshly made pitla-bhakhar and techa, a mixture of freshly ground onions and chillies! and the tempted look on ever trekker’s face was hard to miss! The trekkers were seen feasting on the delicious food and talking nineteen to the dozen! After having the mouth-watering fare, we headed to the bus. 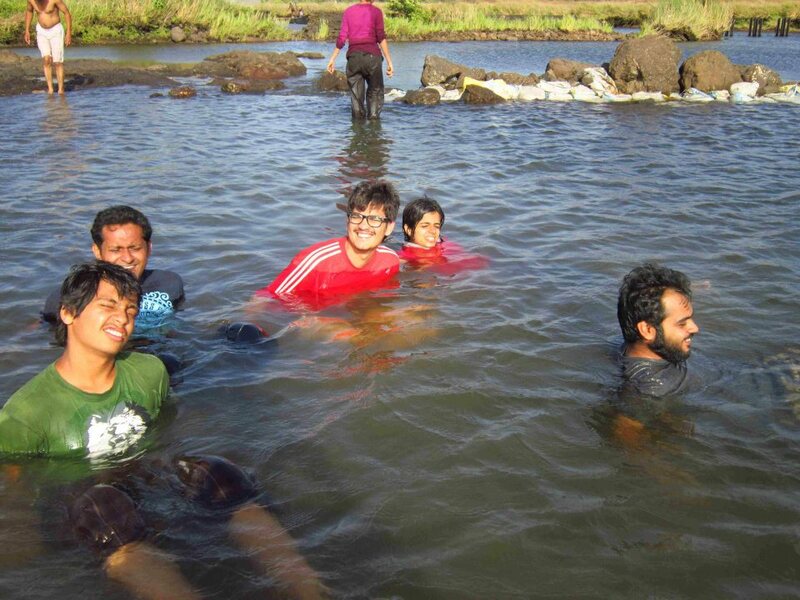 The journey for home had begun but before we hit the NH4, there was a stop to be made – the river stream! On our way back, we kept looking for a suitable spot to take a dip in, into the river stream! Soon enough we spotted a nice place and immediately jumped off the bus with the Man In Charge to quickly examine the waters. 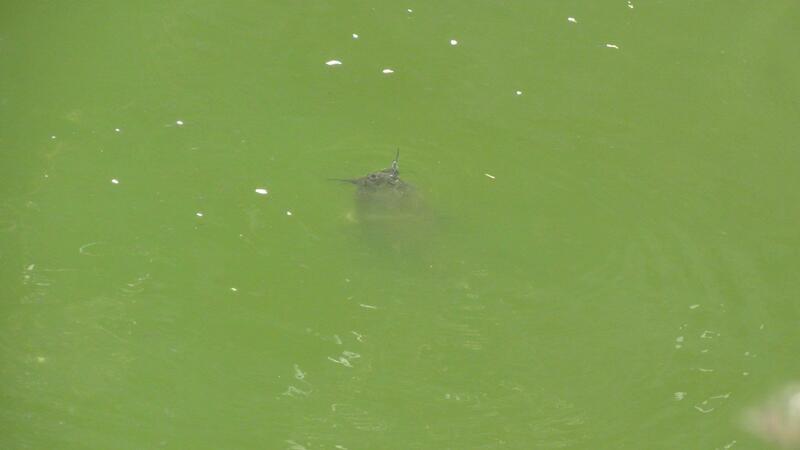 On obtaining his approval, we jumped into the cool waters! Soon, others followed, too (at around 4.50 pm). 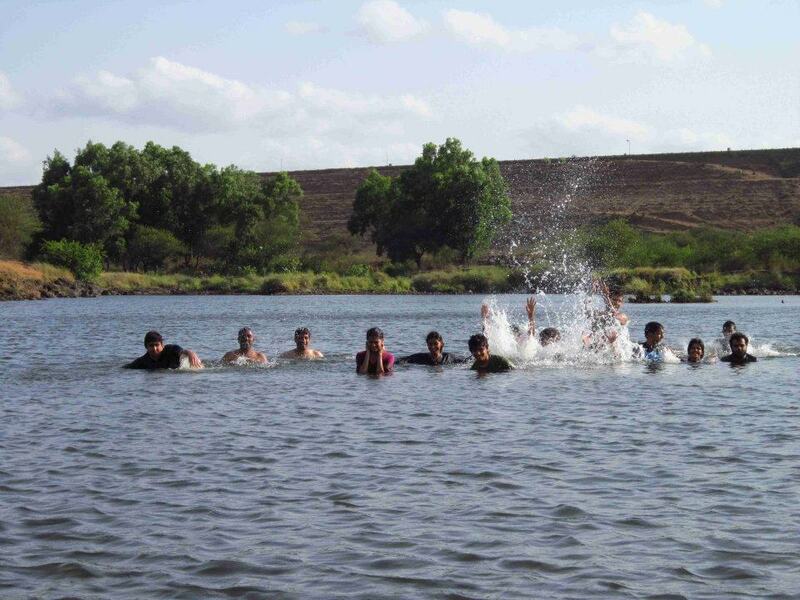 What ensued was a fun filled time – swimming, trying to swim, splashing water, hand-standing and major bonding. We got out of the water only 5.30pm (the winds made us freeze!) and after a quick change, we left for Mumbai! En route Mumbai, we stopped at Lonavala for some chikki (One cannot possibly exit Lonavala without buying chikki, can one?) following which another halt at Datt vada pav was taken. The return journeys always make me feel happy-sad. Happy, for having had a wonderful day and sad because it marks the end of a wonderful day. We usually sing songs during return journeys. But this time, no songs were sung. We were instead having animated conversations on various topics – academics, society, news, travel and a lot of other things!We spoke about things that mattered as well those that didn’t really matter very much. We had fun even as we spoke. 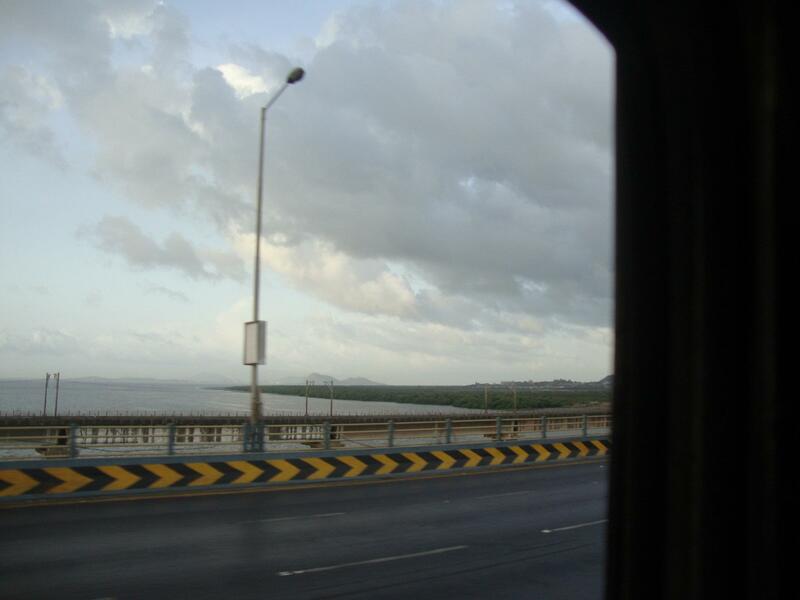 Soon, we reached Mumbai, and thereby ended another beautiful day with Mother Nature. In conclusion, I would like to quote a famous man even though it doesn’t directly really relate to this piece . “ Not just the Spanish Main, love. The entire ocean. The entire wo’ld. Wherever we want to go, we’ll go. That’s what a ship is, you know. It’s not just a keel and a hull and a deck and sails. That’s what a ship needs but what a ship is…what the Black Pearl really is…is freedom.” — Captain Jack Sparrow, Pirates of the Caribbean –The curse of the Black Pearl. Every time I think of Breakfree Journeys, the treks and the travel, I think of freedom. With every visit to a new place, I feel free. With every mountain that we climb, comes a sense of achievement. With every fort we visit and every river we take a dip in, comes an inexplicable high. Even at Tikona fort, we did taste freedom. We did smell enjoyment. We did break free! 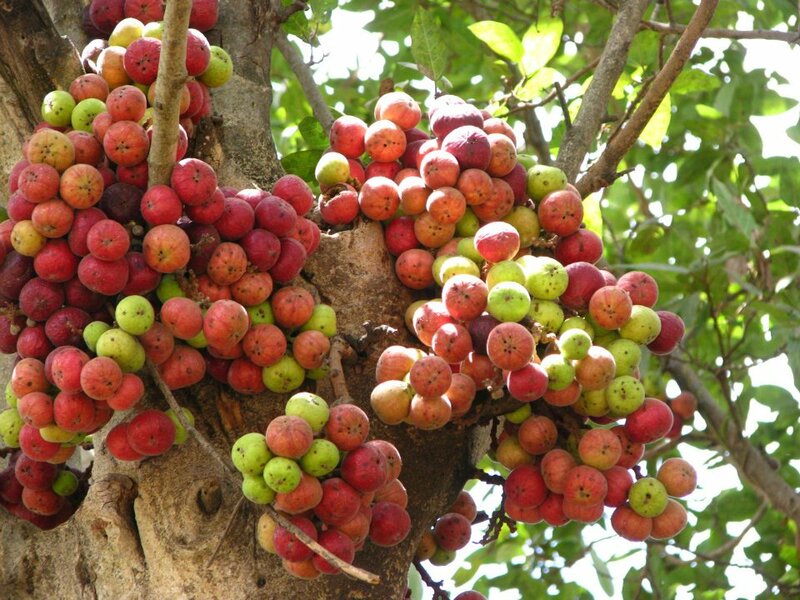 PS : If you plan to visit Vitangad and need a guide, you can contact Sujit – 9545863824. He can arrange for some mouth watering local food, too! 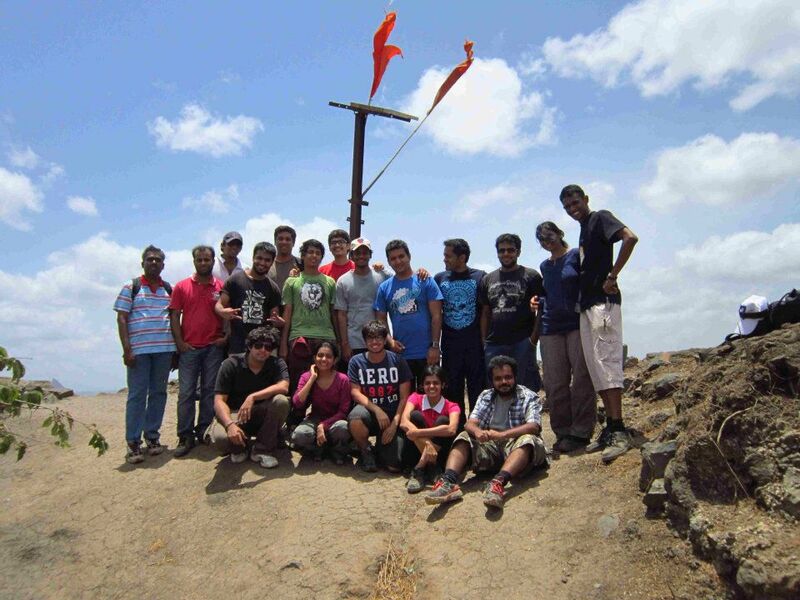 PPS : A big thank you to Breakfree Journeys and Rushikesh Kulkarni for the wonderful trek! Thank you Kavya, Karan, Vipul, Krish, Aditya, Sreejith, Abhijeet for the beautiful pictures. 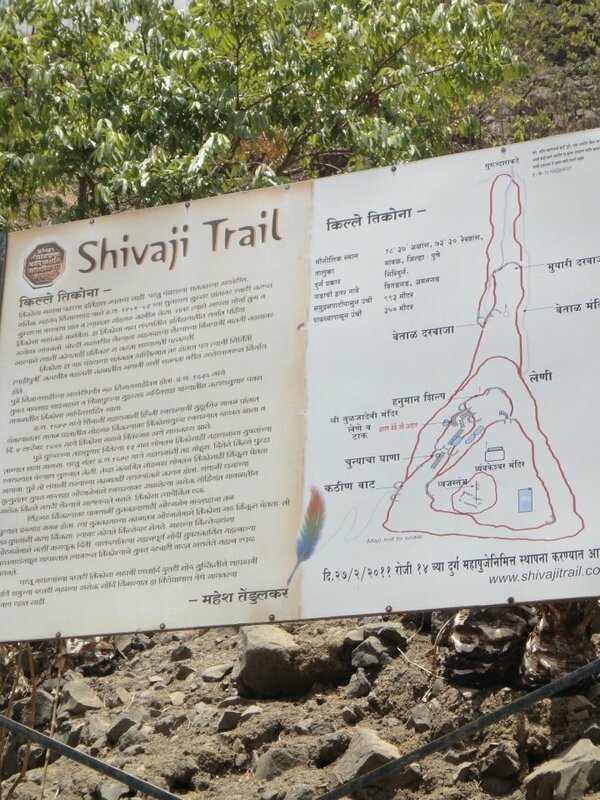 This entry was posted in Breaking Free!, Travelling with K and tagged Breakfree Journeys, Lonavala, Pawna, Shivaji, Tikona fort, Tikona village, trek, Vitangad. Bookmark the permalink.